Kudos to the ground crew. The future of Britain is at stake. Had me going for a min. lol what kind of puddy did you put that together with? Captain Black Hawk's journal wrote: Making it safely home in safety with my aircrew, I breathed a sigh of relief. It was not my preferred style to pilot an aircraft with munitions replaced by camera equipment. Yet the DH-98 didn't fail me, I am amazed at the structural strength of the plywood bird and its two Rolls-Royce Merlin 76 V-12 engines pumping out 3420 total horsepower that helped keep me well ahead of several ME-109's I encountered. It must have been by pure luck that the enemy artillery flak battery managed a hit. I was further delighted with word from my squadron commander that my reconnaissance photo flight deep into enemy territory had provided invaluable information on pinpointing previously unknown locations of several forward Gestapo headquarters. I still am filled with a sense of awe when earlier that day, a Danish farmer gave us friendly hand salute to my aircrew as we passed by his farm at low level to avoid enemy detection and antiaircraft placements, as we further penetrated deeper into enemy territory. Freshly painted by our squadron's best artist mechanic, my battle scarred bird on the aircraft forward fuselage gained another token of meritorious service, to signify that my earlier mission before this reconnaissance flight was not in vain. It signifies the gratitude of my fellow comrades in the other Mosquito, whose lives were spared. A sense of satisfaction overwhelmed me when I observed the humbled parachuting enemy pilot watch his mortally wounded ME-109 plunge to the ground in flames after being peppered with my DH-98's incendiary rounds. For GB: Two small tubes of Harbor Fright Super Glue and about a teaspoon of baking soda. For GG: Your "Further Back" story had me in stitches! I only meant to paint (YuckYuck, a pun) a picture for why my paintjob didn't blend the wreck/repair. Yours was so good I showed it to my work mate! Thanks, Jim for the kind words. I've always like the looks of the Mosquito. I've got a Sterling 36" P-38 profile CL that I've been wanting to build. Only reason I haven't is I'll have to modify its construction to make the landing gear more robust. Already have 2 Enya .09-III venturi engines for it. Landing gear is sandwiched between 2 sheets of 3/16" balsa for a 3/8" thick profile fuselage and engine pod booms. A hard landing will break loose the landing gear wire. 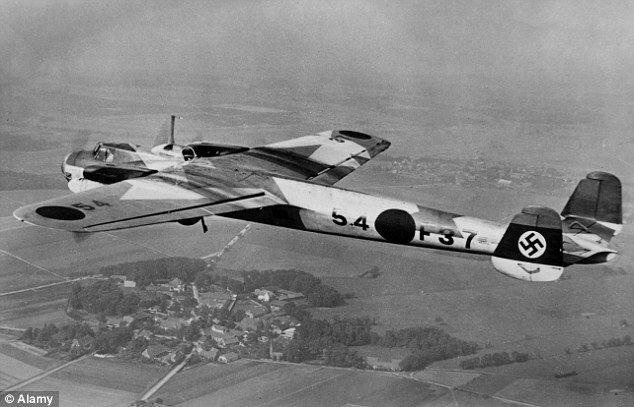 Another one I like is the Focke Wulf TA-154 Moskito. It came out about the same time as the Mosquito, but never made it past prototyping, because the Germans felt they already had other planes that filled the niche. The Do 17 "Flying Pencil" maybe. GallopingGhostler wrote: Another one I like is the Focke Wulf TA-154 Moskito. It came out about the same time as the Mosquito, but never made it past prototyping, because the Germans felt they already had other planes that filled the niche. Being very streamlined would make for a fast, spirited flying RC.